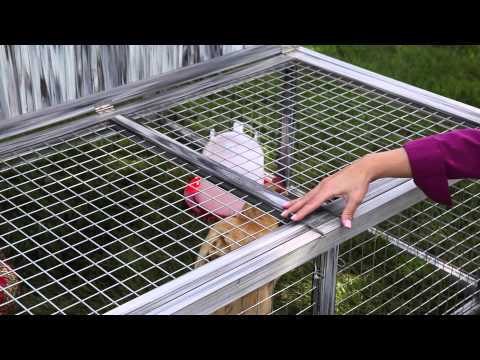 Midwest Hen Haven Chicken Coop is specially designed to give you chickens and rooster a calm and safe environment. Made with weather-resistant durable composite plastic wood, the MidWest Hen Haven Chicken Coop features a huge galvanized wire mesh fence enclosed run for exercise paired with an elevated living area that is equipped with roosting bars, nesting area, easy-to-clean removable floor tray. Actual Wire Nest: 11.25"L x 22"W x 6"H (The height of nest is from the wooden shelf to the wire nest). i dont think the runs measurements are possible? 114 inches could be twice as tall as a person is! BEST ANSWER: 53â€ L x 49.875â€ W x 45â€ H are the dimensions of the nesting unit. 134.6â€ L x 126.6 W x 114.3â€ H are the dimensions of the fenced run . Are the dimensions for this coop correct? It does not look as large as the listed specs. BEST ANSWER: Those are the measurements that were provided by the manufacturer.